Evidence based medicine (EBM) consists of identifying a clinical problem or question, doing a focused search in the literature for relevant studies, choosing the most pertinent studies, and critically evaluating them for guidance as to the right answer to the initial clinical question. 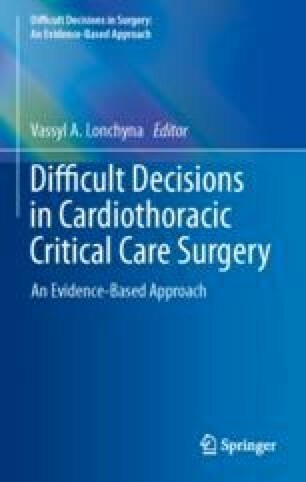 This is a volume that is dependent upon evidence-based data to support the difficult decisions made in the course of treating critically ill patients in the ICU. The authors were tasked with developing their chapter themes by structuring the questions to be asked according to the PICO (Patients of interest, the Intervention that was applied, Comparator patients with similar conditions but treated differently, and Outcomes of interest) model. https://upload.wikimedia.org/wikipedia/commons/b/ba/Life_of_George_Washington%2C_Deathbed.jpg. Accessed 27 Aug 2018. Wallenborn WM. George Washington’s terminal illness: a modern medical analysis of the last illness and death of George Washington. 1999. The Washington Papers. http://gwpapers.virginia.edu/history/articles/illness/. Accessed 18 Jan 2016. PICO Model. The University of Illinois at Chicago’s Library of the Health Sciences at Peoria. http://researchguides.uic.edu/c.php?g=252338&p=3954402. Accessed 15 Mar 2017. The organizations from 19 countries around the world that have endorsed or are using GRADE. The GRADE working group http://gradeworkinggroup.org. Accessed 23 Aug 2018.